If you’ve been following my blog over the past few weeks, you’ll have seen that I’ve been following the Tone It Up Bikini Series. However, this finished on Sunday and I was not happy with myself. 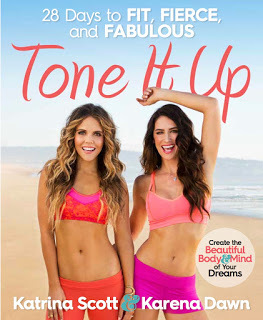 I’ve done pretty much zero exercise in the past fortnight and thank God that the girls at Tone It Up have introduced a new challenge, the Bikini Program! This starts today and already today I have done two out of the three workouts before half past 8! I’m now feeling more motivated for this 8-week segment; since I’ve started the previous Bikini Series, I’ve only lost 2 pounds which is shocking! However, as much as I’d like to lose a few more pounds, this is more about getting fit and healthy for me. This Bikini Program goes hand-in-hand with the girls’ book, Fit, Fierce and Fabulous. I’m still waiting for this book to arrive at my doorstep though! My only issue with the program itself is that I really want to purchase the bundle which includes the DVDs, a new journal and a few other bits and piece; the only problem is it’s $200 and because I’m in the UK, it costs a bomb to get it shipped over aswell! I can still follow the free online weekly schedules and then input my own workouts in from various other platforms. If you’re following the Bikini Program, please comment below as I need a #TIU Buddy! Also, if you want to join up, here the link to Week 1 of the Bikini Program!